The Carryduff girls advanced into Sunday’s semi-final against the hosts and pre-tournament favourites thanks to a convincing 8-12 to 3-4 victory over Armagh champions Dromintee. Alec McGoran’s charges dominated from the start and had Jessica Foy and Erin Robinson in fine scoring form. With the game wrapped up by half time they were able to take their foot off the gas in the second period as thoughts turned to a meeting with the Shaws Road outfit. St Paul’s enjoyed a 9-9 to 1-4 victory on the road against O’Donovan Rossa, Magherafelt at the weekend with Kirsty McGuinness, Debbie Boyd and Siobhan Bell the Derry girls’ tormentors in chief. The trio racked up 7-4 of the total between them and will have to be watched if Carryduff wish to advance into the final and reverse a defeat to the West Belfast club earlier in the year. During that league encounter, the Antrim club edged past their Down rivals 3-10 to 3-6 and another tight, yet entertaining, encounter is expected at the weekend. However, Carryduff have top players of their own and will look to the ever impressive Erin Robinson, Megan Doherty, Niamh Molloy, Jessica Foy, Orla McKay and speedster Hannah Magorrian to unsettle the West Belfast club. “We played St Paul’s in the Ulster Minor League earlier in the year and lost by a couple of points but St Paul’s went on to win it,” said the St Malachy’s school teacher. “They are a very good team but the game was very close. The reward for the victors will be a place in the final against either Killeeshil (Tyrone) or Termon (Donegal). While some may believe the winners of Carryduff v St Paul’s would enter the final as favourites, McGoran rejected such talk and said that any one of the remaining four could claim the trophy. “I don’t think so. There are some tremendously strong teams on both sides of the draw so whoever makes it that far will produce a cracking final,” countered the Carryduff manager. “You have the Donegal and Tyrone champions still there and both are extremely good. The tournament is the brainchild of St Paul’s stalwarts Brian and Donna Coyle and runs in tandem with the male equivalent that is also at the semi-final stage. The Carryduff manager says he is delighted to be part of such a competition and thanked Brian and Donna Coyle for giving the girls a chance to compete for provincial glory. He also paid tribute to his players and everyone at the club who have supported his team this year and is hoping they will have a large following on Sunday. “I think this is a fantastic thing and I am really grateful to Brian Coyle for giving us the chance to play in an Ulster competition,” he added. “This is a great experience for the girls and they are looking forward to it so it is a great way to finish off the year. 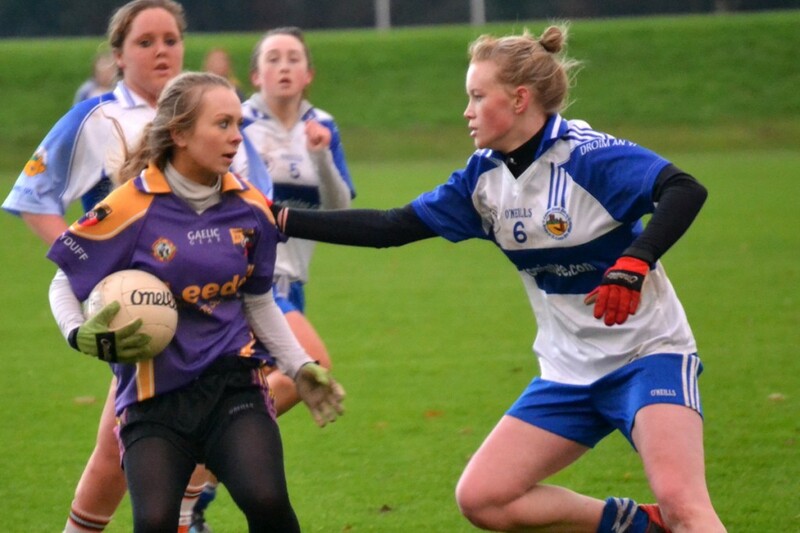 “Most of our girls would have played senior football this year while others played on the junior team that won Down and played in Ulster so there is a lot of experience. “That has really stood them in good stead for this competition. Some of the girls are playing school football at the minute and some are at university so that also stands to us. “Our girls are very enthusiastic but our club has been fantastic to them and supported them all the way.